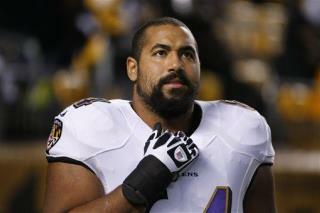 (Newser) – Baltimore Ravens offensive lineman John Urschel is 6 feet 3 inches tall and weighs 305 pounds—but his brain may be more intimidating than his bulk. The 24-year-old, who already holds two math degrees, will begin his math PhD at MIT this offseason, specializing in spectral graph theory, numerical linear algebra, and machine learning, the Baltimore Sun reports. Urschel was already well-known for his academic achievements, having taught trigonometry and analytic geometry as part of his master's degree while playing at Penn State, reports Onward State. His published research includes "A Cascadic Multigrid Algorithm for Computing the Fiedler Vector of Graph Laplacians." Hey, gjsals! Why are white dudes like you so threatened by a brilliant black guy? Let go of your animosity, discard your regret at your own lost dreams, and celebrate someone else's. That act alone just might free up some good energy in you. Best of intentions. You need them. The first that I can remember with a PHD in the NFL was Frank Ryan, a Quarterback. 10 plus 5 equals 15. Thanks to affirmative action your a Phd candidate!